Every once in awhile I test out a product that makes me think, "Now, why didn't I think of that?" Seriously, Lash Genius is a genius invention! It is a clear gel that waterproofs any mascara and/or makes your mascara super smudge resistant and long wearing! I am quite surprised that no one thought of this sooner? Or, if they did, I never heard of it (Ya'll correct me if I am wrong! 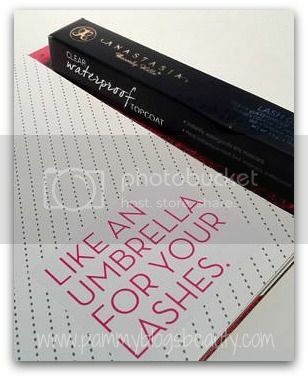 There must be another water-proofer out there for lashes???). Lash Genius Waterproof Top Coat by Anastasia Beverly Hills is a must-have summer item for any girl who loves to vacation by the water or just spend time by her neighborhood pool (like me!). The Dilemma Solved: Waterproof or Non-Waterproof Mascara? This product solves a "major" lash dilemma that I have every summer: You see, usually, I end up at the pool on a whim in the afternoon. This presents a problem as I apply my makeup first thing in the morning and I do not wear waterproof mascara on a day-to-day basis. So, many times, I end up at the pool with non-waterproof mascara...oops! With Lash Genius, I can just swipe on a layer over my usual mascara before heading out the door and I am good-to-go with waterproofed mascara! Plus, I don't have to buy a tube of waterproof mascara! I can just use Lash Genius Waterproof Top Coat over any mascara in my current rotation. True Genius!!! So, besides all that, how is the wear? The wand allows for easy application.You just swipe this waterproof formula right over your mascara. It is that easy! Lash Genius leaves behind a glossy clear coat. It dries quickly and is not the least bit clumpy, sticky, nor hard. Lash Genius works great! It really does waterproof quite well! Not only does it waterproof, but it increases the wear of my mascara period. I feel like I get fewer smudges and overall longer wear. My eyes are very prone to tearing (from irritation from debris in the air, the bright sun, etc). This Lash Genius protects my mascara from running or smudging from random irritation tears. I know that I will be wearing Lash Genius over my regular mascara the next time I go to a wedding or to visit a newborn baby! I know what you are thinking. A product that increases a products wear and makes it resistant to water must be hard to remove. Right??? Well, not in this case! This product was just as easy to take off as my regular mascara. Granted, I don't just use soap and water on a daily basis to remove mascara. I actually use a makeup remover (Neutrogena's Oil Free Makeup Remover: it is super gentle and I love it!). Now, the Neutrogena remover does work on Waterproof mascara. So, that is why I think it removed the Lash Genius/Mascara combo so well. Lash Genius is too strong to remove with soap and water alone. Here is a video with some tips! 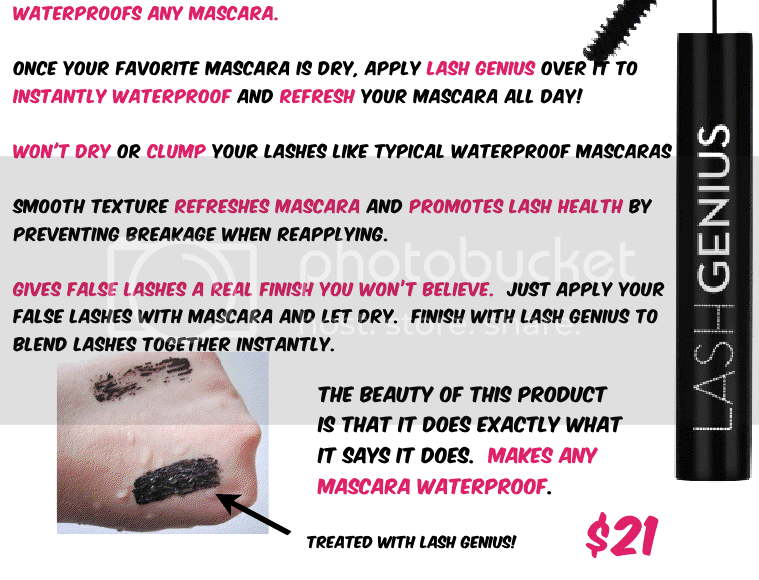 Lash Genius Waterproof Topcoat retails for approximately $21.00 for a .19 oz tube. 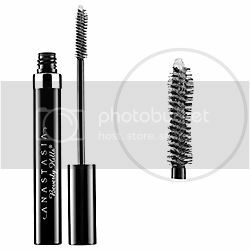 Clear/colorless gel waterproofs any mascara without making mascara "hard"
This product works really well for waterproofing my lashes! 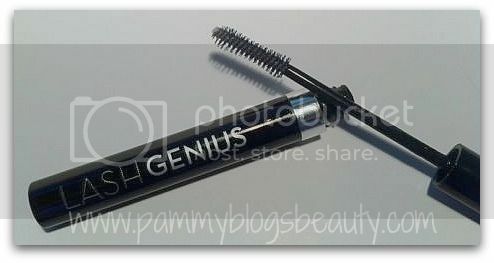 I would much rather use Lash Genius than a separate waterproof mascara. I love the convenience of just swiping this clear gel over my existing mascara. Not only can I use it for waterproofing when planning on swimming, it can also increase your mascara's wear for any activity or issue that makes your mascara "wet": crying (hopefully tears of happiness!!! not sadness), eyes tearing from irritation, sweating, etc!